Cindy Holmes, Regina Angelo, Genie Abrams, and Karen Mejia were sworn in as new council members during a ceremony at Newburgh's City Hall on Saturday, January 11, 2014. 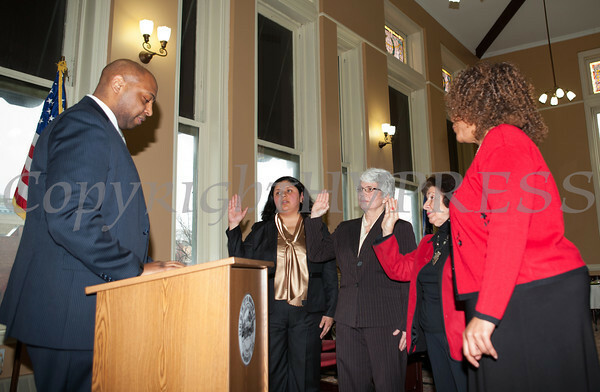 Judge Eddie Loren Williams administers the oath of office during the swearing-in of council members Karen Mejia, Genie Abrams, Regina Angelo and Cindy Holmes, at Newburgh's City Hall under the new ward system on Saturday, January 11, 2014. Hudson Valley Press/CHUCK STEWART, JR.